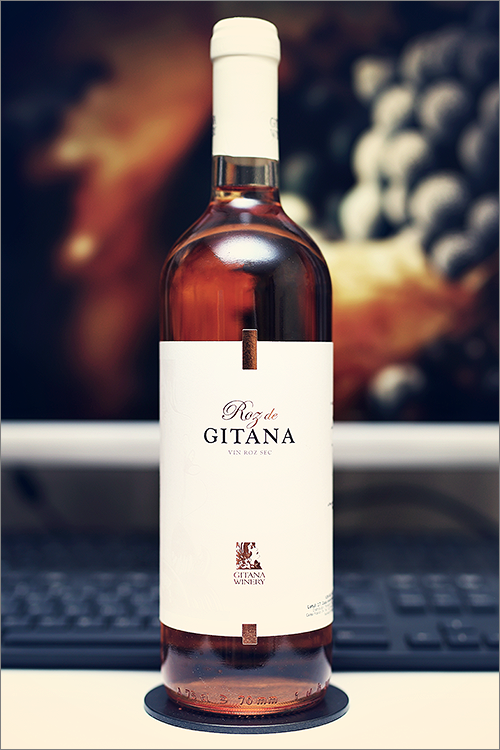 Tonight we are going to bring up something delicious for the review: a single varietal rosé wine – Roz de Gitana by Gitana Winery. This wine is part of the newly released entry-level wine series, that is made of three wines, each one with its own personality and character. The winemaker hopes to fusion the generosity of nature with the human labour, backed by an exceptional terroir of the Valul lui Traian region. A rosé wine happens when the juice of a red wine is strained from its skins before it becomes too dark, thus, the winemaker’s biggest challenge is to find the right moment, before the wine is colour-spoiled. But enough theory, without further ado, let’s get to the tasting! Pale orange-salmon color, with onion-orange shades towards the rim of the glass. The nose is strong, filled mostly with sweet fruits and citrus flavours: ripe wolfberry, red mirabelle, berberry, strawberry, red plum, cranberry, red cherry, red apple, overripe rose hips, pink mulberry, red grapefruit, sicilia orange and some nuanced hints of honey. The wine is medium-dry, with high alcohol level, high acidity and ripe tannin. This is a fruity, crisp and refreshing rosé wine, with an appealing sweet accent. It tastes nuanced, complex and firm. It has a fair overall balance and it feels fine, well structured and rich, with a touch of alcoholic warmth showing through towards the end. The wine has a medium-plus finish and a balanced, crisp and fruity-citrusy aftertaste. This is definitely a fine Wine of Moldova and the overall rating says the same, with 90.3 points scored it is right there, among the best wines we’ve tasted so far. Please click on the chart icon on the left in order to get to the wine rating page, where you can find all the wines we’ve tasted to date. Conclusion: this is a wine in its prime: fine, refined and very appealing, with a nuanced fruity-citrusy accent – a wine that can still age for another 6 to 9 months, yet we do not recommend it at all. It has a harmonious structure and it feels well balanced overall, therefore we insist to try it now, as long as it is still young and beautiful. Its grippy tannins and the mouth-watering acidity makes it an ideal pairing partner for any sweet and creamy desserts, like for example blueberry panna cotta or berry brioche cake.